Many people who take up yoga, in time, decide to make a further lifestyle change and opt for vegetarianism or veganism. Balancing dietary needs and overcoming dietary challenges can be difficult for people who have just decided to cut meat/animal products from their diets. 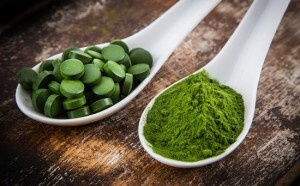 Often someone will advise them to take spirulina as a boost but is this actually sound advice? Is spirulina really the miracle superfood that it is promoted to be or is there a dark side to this blue-green algae product? I first started taking spirulina in the 1990’s due to the promoted health benefits. As many know, spirulina is rich in protein, vitamins, minerals, carotenoids and antioxidants. It also has B vitamins, beta carotene, vitamin E, manganese, zinc, copper, iron, selenium and gamma linoleic acid. Whew – pretty decent list of goodies from an algae! Spirulina was also heavily promoted in the past as a reliable plant based source of vitamin B12 (Cobalamin). Although the body needs very little B12 (between 2.4 – 3 mcg/day), it is required to form DNA, make healthy blood cells and maintain proper nerve function. B12 appears to be found in its highest concentrates in offal meat and sea molluscs. To get a daily serving as a vegetarian you have to eat approx. 4 eggs or drink 2 glasses of milk. Not too enticing if you are lactose intolerant, cholesterol concerned or a vegan. This is where spirulina came in. BUT…The hype does not tell you that spirulina, despite all its other benefits contains inactive B12 analogues that may even have the ability to interfere with B12 absorption. An analogue in chemistry is a compound that is structurally similar to another but differs very slightly (usually just the replacement of one atom with another). This then ‘fools’ the body into thinking that it is the real deal so the body mistakenly absorbs it but receives no subsequent benefit. The reason that these analogues interfere with absorption of B12 is that they tend to occupy the B12 receptor sites, blocking the real B12 from actually getting through. This was published in the American Journal of Clinical Nutrition in 1988 (see reference below) but was somehow missed(?) by the spirulina distributors of the time. Spirulina is not the only culprit. Other vegan sources that are also often promoted, including dried nori, tempeh, organic produce and barley grass have also been shown through direct studies to be inadequate. Blood testing for B12 levels after eating these products for a period of time is unreliable due to the analogues which remain present in the blood stream and of course, fool the test. So, what is the answer to protecting against a B12 deficiency that shows its early symptoms as fatigue, tingling, numbness, blurred vision and abnormal gait due to its causing anemia or nervous system damage? Veganhealth.org advocate that vegans (and I would suggest vegetarians also) eat B12 fortified foods and take B12 supplements. B12 supplements should be taken separately rather than part of a multi vitamin supplement as, again, the B12 can interact with vitamin c, iron and copper to produce its own analogue! I realize that the jury is out as to whether the analogues in spirulina are sufficient to block the B12 receptors fully and so prevent absorption of real B12 but that jury being out is sufficient for me. I made the choice to take a vegan B12 supplement, kick my spirulina to the curb and focus more on getting the nutrients that I require through greater focus on my diet. Nothing beats fresh food, prepared with love, to fill the nutrient basket. It may be difficult at first when you make the transition away from an omnivore diet but learning to truly balance your nutrition is incredibly beneficial in the long run. Herbert V (1988) “Vitamin B-12: plant sources, requirements, and assay.” American Journal of Clinical Nutrition, vol. 48, pp. 852-858.